Cut celery stalk into small pieces to resemble pumpkin stem. Place celery in to the opening hole of the clementine and serve. Peel bananas and cut them in half. Fill a small bowl with coconut water and another small bowl or plate with the shredded coconut. Carefully dip a bananas into the coconut water, and then immediately coat with shredded coconut. Repeat with all banana halves. Once fully coated, use small chocolate chips to create eyes and an open mouth. Cut apples into quarters. Then cut out a small hole in the center of the peel on each quarter. Be careful not to cut all the way through. Fill each hole with nut butter or jam. Use the slivered almonds as teeth, and stick into the top and bottom of the hole. 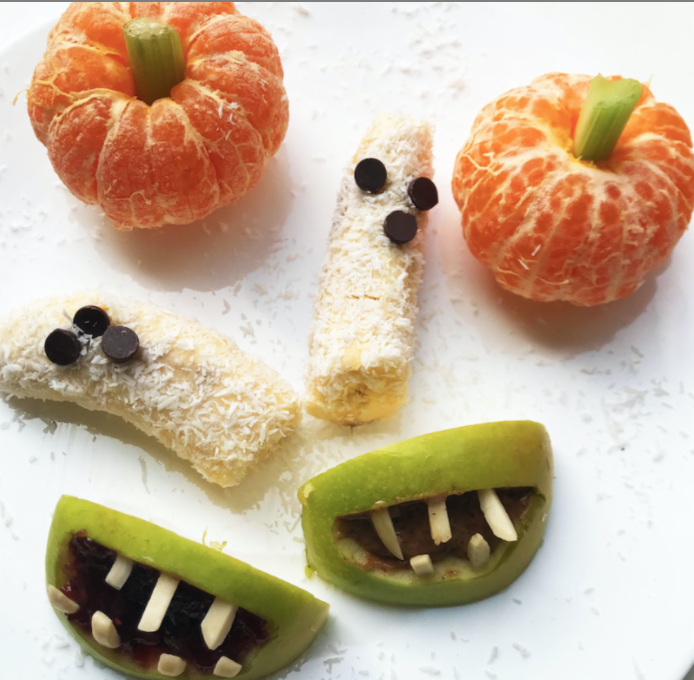 Serve all three snacks together for the full Halloween effect!